Draw on one side of a mirror line while the Mirror Tool copies the results to the other side. The Mirror Tools are accessed along the toolbar. You can move the location of the mirror line by grabbing the handle. Mirror Tools give a similar result to the Multibrush Tool, but unlike the Multibrush which only traces brush strokes like the Freehand Brush Tool, the Mirror Tools can be used with any other tool that traces strokes, such as the Straight Line Tool and the Bezier Curve Tool, and even with the Multibrush Tool. Horizontal Mirror Tool - Mirror the results along the horizontal axis. Vertical Mirror Tool - Mirror the results along the vertical axis. There are additional options for each tool. You can access these by the clicking the drop-down arrow located on the right of each tool. Hide Mirror Line (toggle) – Locks the mirror axis and hides the axis line. Lock (toggle) - hides the move icon on the axis line. Move to Canvas Center - Moves the axis line to the center of the canvas. The Mirror Tool can only mirror along a perfectly vertical or horizontal line. 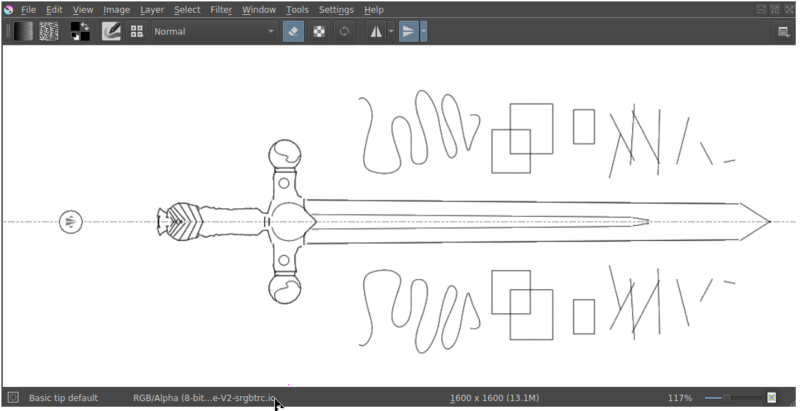 To mirror along a line that is at a rotated angle, use the Multibrush Tool and its various parameters, it has more advanced options besides basic symmetry.